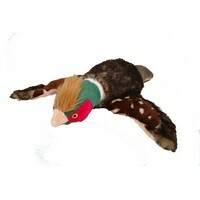 Fluff & Tuff Ike the Pheasant is the perfect choice for your bird dog, or any dog who loves to play fetch or tug-of-war. With his long, floppy wings, Ike is also a great choice for dogs that love to whip and shake their toys. The Fluff & Tuff Ike the Pheasant has double-stitched reinforced seams, sewn eyes, durable mesh inner lining for the under amour and a non-toxic fibre stuffing for your dog's enjoyment.